: It’s spring and asparagus leek chowder is on the menu for weekday supper. Steamed, sautéed, roasted or grilled — asparagus takes on differently delicious qualities depending on how you cook it. Roasting and grilling turns asparagus almost sweet. Steamed, it retains the heart of its natural flavor. Please, please don’t boil these lovely stalks. That’s how they often get cooked beyond all recognition and loses a lot of their healthfulness. Did you know that one serving provides 100% of daily vitamin K needs not to mention being with packed with vitamins A, C, E and B-6, as well as iron, copper, calcium and fiber? Many people prefer pencil-thin asparagus spears as their delicate texture makes them great for salads and even eaten raw. But the thicker ones are more flavorful and they stand up better to cooking methods like grilling. In any case, be sure to break off the tough wooden ends by bending the spear a few times to find a place where it breaks easily. You don’t really need to peel them unless you’re going for a smooth look or eating the spears raw. This quintessential spring vegetable might be available at the grocery all year long, but it’s only during the season that these stalks are as flavorful and tender as they should be. Now that spring has officially arrived, what better time to showcase them as a meal’s centerpiece. 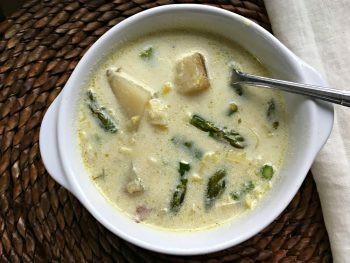 A reliable asparagus dish that’s easy to make is a chowder pairing leeks and potatoes with the flavorful spears. Leeks make a great partner. An underappreciated member of the allium world, they lend a fresh sweetness to dishes and a lively grassy color. The potatoes add heft to the soup. What’s not to like about this for a spring dinner?